The Holiday Inn Select is located near the San Antonio airport and only minutes from beautiful downtown and its many attractions. With its recent six million dollar renovation, the hotel and its 397 guest rooms are fully equipped to accommodate every traveler’s needs, whether for business or pleasure. San Antonio has been experiencing a drought for many years. Increased population growth is also straining the water resources, and water restrictions are enforced year-round. Many industries rely on water for their survival, and hospitality is no different. Without a reliable water supply, hotels would struggle to satisfy customer requirements. However, the Holiday Inn Select is leading the way in conserving water and protecting the environment. Holiday Inn Select had an in-house guest that knew about SAWS commercial programs for water conservation and discussed the potential with Larsen. 40% of SAWS’ annual water sales are from commercial customers, such as the hospitality industry, and there is a great potential for water savings through the commercial conservation programs. Larsen contacted SAWS regarding water conservation programs, and in July 2007, the Holiday Inn Select began installing high efficiency toilets. A high efficiency toilet provides a 20% water savings over the industry standard of 1.6 gallons per flush. Many households and industries have toilets installed that use considerably more water per flush: 3.5 gallon, 5 gallon, and even 7 gallon toilets are still being used. By simply replacing an older, high volume toilet with a high efficiency toilet, thousands of gallons of water could be saved in a single household. Prior to July 2007, the Holiday Inn Select had 3.5 gallon per flush toilets installed in their 397 guest rooms. Through the SAWS commercial program, Caroma Sydney 270 elongated toilets were chosen to replace the older toilets. The Sydney 270 elongated toilets, as well as all Caroma toilets, are high efficiency and dual flush. Being dual flush, the user has two options for flushing. A full flush for solid waste uses 1.6 gallons of water per flush. A half flush is used for liquid and paper waste and uses only 0.8 gallons of water per flush. Based on a one to four solid to liquid flush ratio, the Sydney range of toilets averages only 0.96 gallons per flush. 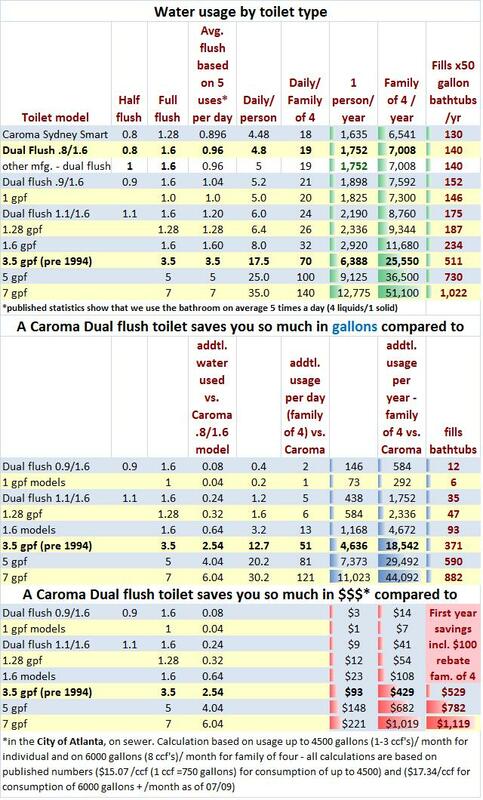 Comparing that to the 3.5 gallon toilets previously installed, each Caroma toilet installed saves more than 2.5 gallons per flush. “Installing the Caroma dual flush toilets are one of the best ways to conserve water,” states Larsen. “After just one month of use, the water savings were tremendous. It is amazing to think that if we are only at 50% occupancy and have three flushes per room, we’d save more than 1500 gallons of water – in just one day! Combining the savings from the Caroma toilets and high efficiency showerheads, we expect to save about 6.9 million gallons of water per year.” The water savings have been impressive. For example, when comparing January-November 2006 versus 2008 indoor water usage results, the Holiday Inn Select saved more than 4.4 million gallons of water, averaging a 31% savings each month. Holiday Inn Select is a conservation leader. Not only are they saving millions of gallons of water each year, but they are the first hotel in San Antonio to implement a recycling program. Starting at the end of 2006 with recycling paper, the hotel saved 21 million tons in the first year! The successful program then expanded to include glass, cardboard, aluminum, and paper, and in the first five months, saved more than 37 million tons of recycled material. This is a substantial savings for the local landfills. In early 2006, the hotel also replaced older light bulbs with compact fluorescent lighting. This uses less energy and saves on greenhouse gas emissions. Combining the recycling and lighting conservation efforts, the hotel is expecting to save $44,000 per year. Holiday Inn Select is a true leader in resource conservation. With its water conservation efforts replacing older fixtures with high efficiency Caroma toilets and showerheads, recycling and lighting programs, Holiday Inn Select San Antonio Airport is a pioneer for the hospitality industry. During 2009, Caroma will be replacing the Sydney range of high efficiency toilets with Sydney Smart HETs, providing even greater water savings. The dual flush Sydney Smart range uses 1.28 gallons per flush for a full flush and 0.8 gallons per flush for half flush, averaging only 0.9 gallons per flush. The Sydney Smart range includes six bowl configurations and is now available in white and biscuit.